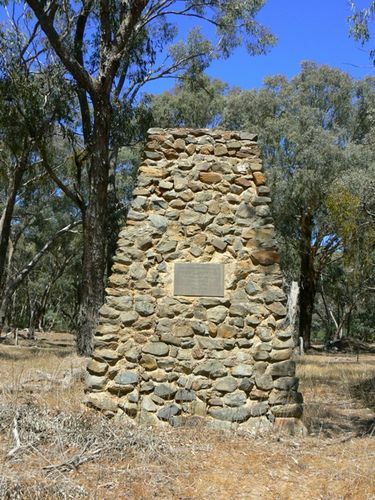 A cairn commemorates the Hume & Hovell expedition which passed through the area in 1824. At the committee rooms at Collins street, Melbourne, on Friday, the conmmittee in charge of the centenary celebrations of the Hume and Hovell explorations met to discuss the timetable for the unveiling of monuments along the route followed by the two pioneers. Sir J. Barrett was in the chair. After much discussion it was agreed that, with the co-operation of the Royal Automobile Club, the route followed would be as follows : Starting from Bright on Sunday, 16th November, they will unveil a tablet at the foot of Mount Buffalo. On Monday they will proceed via Myrtleford, Whorouly, Everton, Murmungee and Stanley, staying at Beechworth overnight. Tuesday's programme covers Back Creek, Allan's Flat, Staghorn Flat, Ebden and Bethanga. Tuesday evening and Wednesday will be spent at Albury, where a sports meeting and concert has been arranged. At Wangarratta the party will divide, the main party proceeding to Benalla, where a civic reception has been arranged. They will proceed thence to Violet Town, Euroa, Avenel and Seymour. The remainder will proceed via Edi, Hansonville, Somaria and Swanpool to Merton. On the Friday this second party will travel from Avenel through Bonnie Doon and Yarck to Yea. The parties will reunite at Broadford on the Friday and proceed to Melbourne. Sir J. Barrett said the Education Department had arranged demonstrations by school children at all places included in the itinerary, and was making special efforts to interest the children in the history and development of the districts traversed by the explorers. Wodonga and Towong Sentinel (Vic), 26 September 1924. HUME AND HOVELL 24th November 1824.